Handle scales made of black, slightly textured G10. The material is extremely hard and robust, and the textured surface gives it a slip-resistant feel. Compact, practical pocket knife for everyday use. 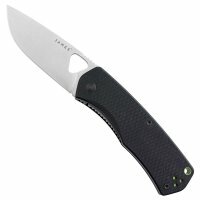 The blade made from American Carpenter CTS BD1 steel* is locked with a liner lock mechanism. The removable clip can be mounted on both sides. Supplied with wooden case with custom-fit milling and a felt pouch. With binding strap. Bevelled on both sides, rustproof. This high-quality display case is lined with soft cow's leather. 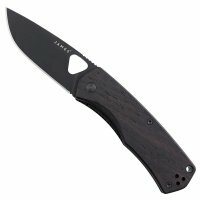 Ideal for storing your folding knife collection. Depending on the version chosen, the case provides storage space for 12 or 18 pocketknives.